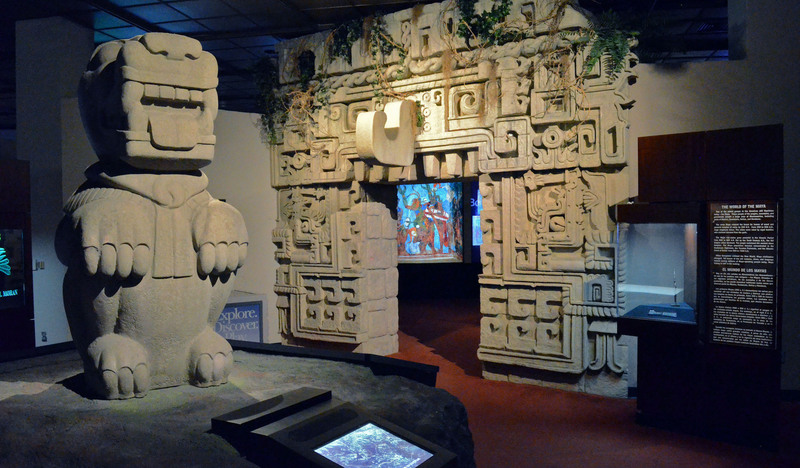 Peer into the ancient past and explore how the world works at the Houston Museum of Natural Science (HMNS) in the Museum District. 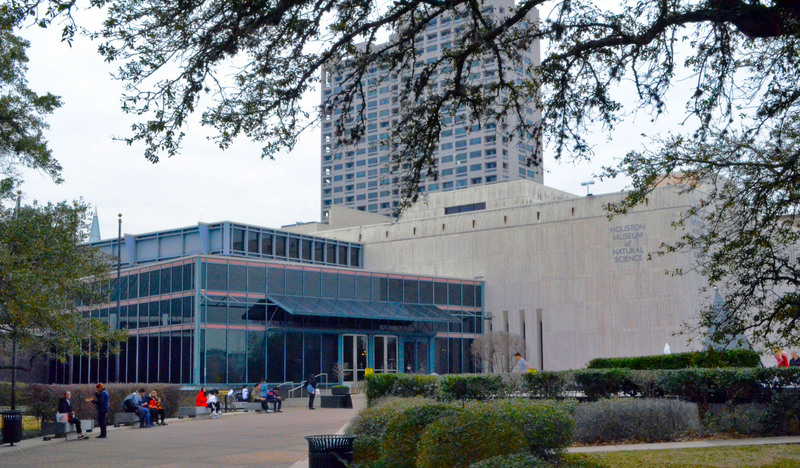 Standing at the edge of the Hermann Park roundabout, the Houston Museum of Natural Science has invited millions of annual visitors over the last century to connect with the world around them. In the meantime, expansion into four floors of sprawling exhibit halls, a tropical butterfly center, a planetarium, a giant screen theater, and the stunning and all-encompassing Hall of Paleontology has elevated the museum to one of the most popular in the country. Visiting a museum of this scale isn’t quite apt for an afternoon drop-in, so grab your walking shoes and get ready for a full day of discovery, or break your explorations into multiple days. The bustling entry hall to the Houston Museum of Natural Science has more than a little in common with some of the world’s great train stations. Ticket booths line the walls, selling memberships, day passes, and tickets to special, limited engagement exhibitions, film screenings, and more. From here, you have the option of heading into the permanent exhibits or adding to your default ticket with any of the a la carte options located in the same entry hall. Recently upgraded to become one of the only 8K-resolution experiences, the Burke Baker Planetarium offers an assortment of full-dome shows from exploring black holes, zooming around the universe, or, yes, even taking in a Pink Floyd sight and sound show. Tickets run $9 for adults and $8 for children. The Wortham Giant Screen Theatre next door offers 3D shows digitally projected onto a massive 60′ x 80′ screen. Immerse yourself in films that bring you up close and personal with the world’s predators and ancient dinosaurs. At $12 for adults and $10 for children, you can grab a seat, even if you’ll only need the edge. At the end of the hall, the Cockrell Butterfly Center provides a unique museum experience, leading guests down pathways in a tropical habitat that’s filled with seemingly thousands of butterflies that flutter around and over your head. 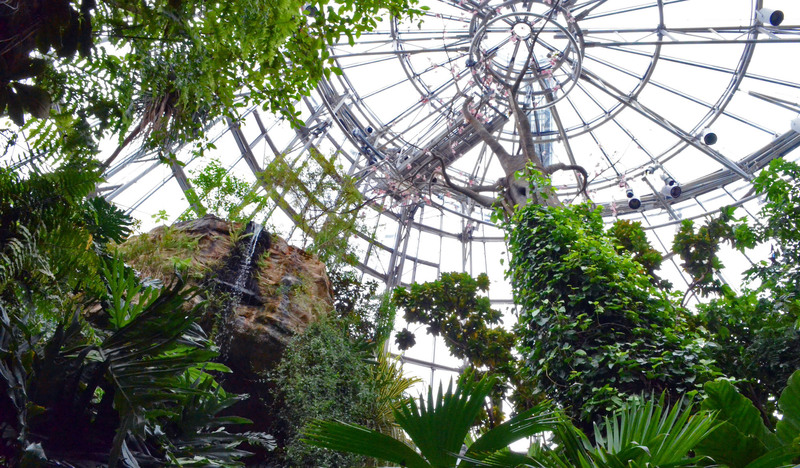 An interactive exhibit hall that leads to the entrance of the butterfly zoo allows for children to have an exciting (or grossed out) encounter with live insects and other activities. Entry costs $9 for adults and $8 for children. From the box office, you’ll enter the permanent exhibits through the Alfred C. Glassell, Jr. Hall. Take a moment to orient yourself on the map and look up to find a projection of the area, allowing you to interact with a menagerie of virtual animals coming out to greet you. The main attraction on this floor is the Morian Hall of Paleontology. 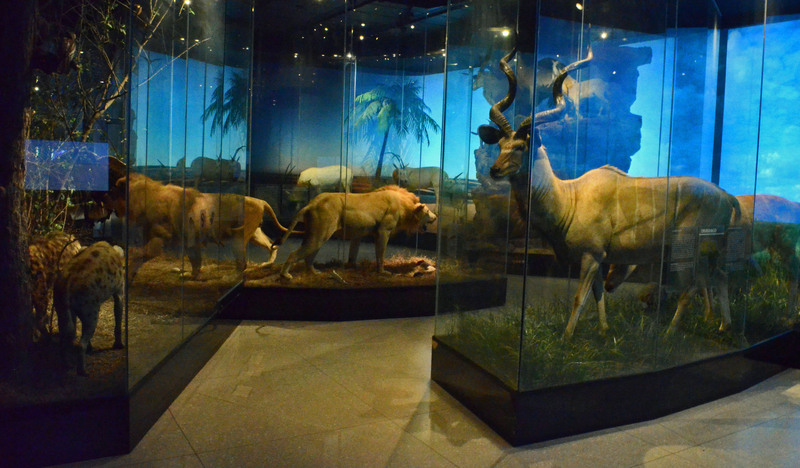 Opened in 2012, it is the pride of the the Houston Museum of Natural Science. It’s one of the largest paleontology halls in the nation, featuring an extensive collection of plant and animal fossils that date back billions of years. Take a chronological journey through this exhibit and learn how our world came to be before whirling around more than 60 major dinosaur skeletons. 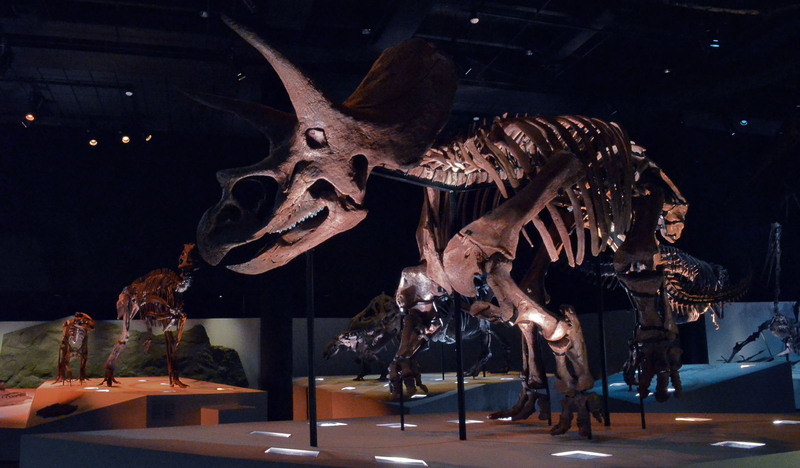 This stunning exhibit is highlighted by the most intact Triceratops skeleton ever discovered, affectionately named Lane. In addition to the skeleton, a mummified portion of his skin has been cast so that guests have the rare opportunity to see and feel dinosaur skin from prehistoric times. As you move up to the second floor of the Houston Museum of Natural Science, your visit with the dinosaurs isn’t quite over as the Morian Overlook, right next to the elevator bay, offers a spectacular view from above of the entire Paleontology Hall. Around the corner, you’ll find two impressive wildlife displays complete with taxidermied animals and meticulously recreated habitats. The Evelyn and Herbert Frensley Hall of African Life takes visitors through seven biomes of the African Continent to view lions, elephants, and one of only two Okapi on display in North America. The Farish Hall of Texas Wildlife, just across from the Africa display, features animals from the seven biotic regions of Texas. From the desert plains of the west, to the fragile coastal environments, visitors leave this exhibit with a powerful understanding of Texas’ ecosystems. At the end of the second level, you’ll also find the hushed Cullen Hall of Gems and Minerals. Over 450 natural specimens and rare gemstones fill this vault, offering guests a chance to see a plethora of stunning, naturally-occurring crystallization as well as the tailored handcrafted gems brought forth by expert jewelry designers. 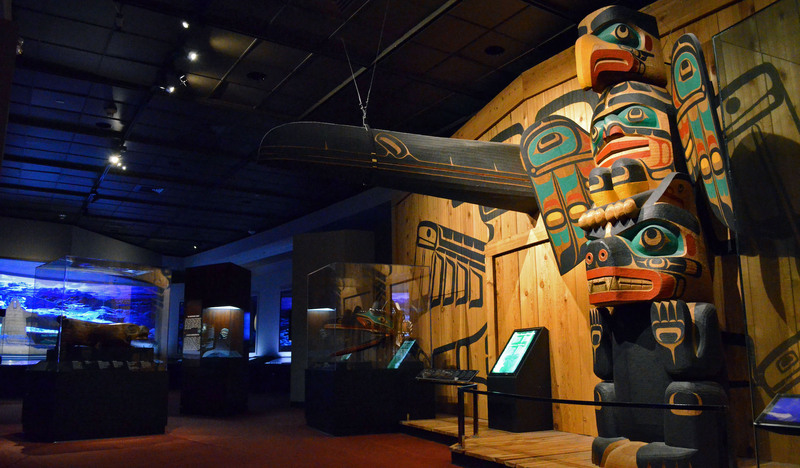 Rising to the third floor of the Houston Museum of Natural Science brings visitors back into the aboriginal past. The John P. McGovern Hall of the Americas tours guests through societies across the Western Hemisphere that have risen and fallen. From Aztecs and Mayans, to the Inuit and Native populations of North America, this wide-ranging exhibit provides a fascinating look into a bygone time. The nearby Hall of Ancient Egypt explores the many facets of Egyptian society such as writing, religion, and mummification. Filled with artifacts and trinkets, the exhibit also offers a very up close and personal look into several sarcophagi and the mummified remains of its previous inhabitants. 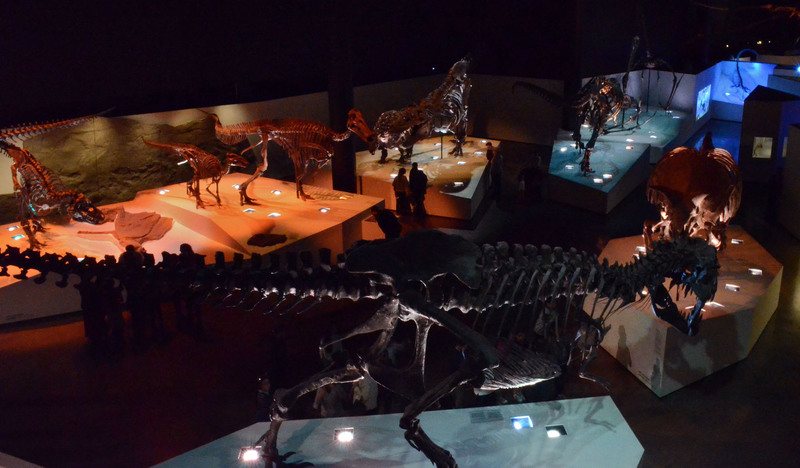 Opened in late 2017, the revamped Weiss Energy Hall at the Houston Museum of Natural Science consumes the entire fourth floor. 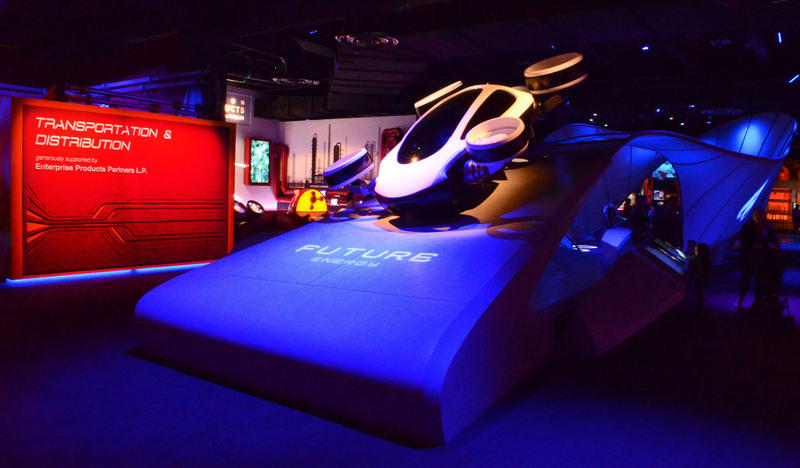 Its new digs allows for a transformation from a tightly packed exhibit on the main level to an expansive, free-flowing hall that educates visitors on how the world creates the energy it needs in a modern age. 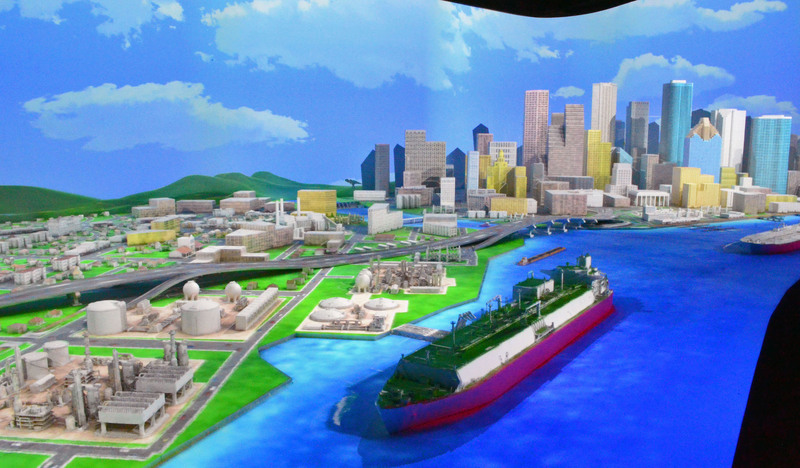 With interactive exhibits that examine natural gas, electricity, and renewable energy (among other things), guests are free to meander around the floor while learning about natural resources. Be sure to find the impressive and colorful 3D projection sequence of Houston tucked away in the back corner that demonstrates how power finds its way to a metropolis. Here, you’ll find the Welch Hall of Chemistry, an interactive KHOU meteorology exhibit, and the planet-probing Earth Forum (undergoing renovations in 2018). 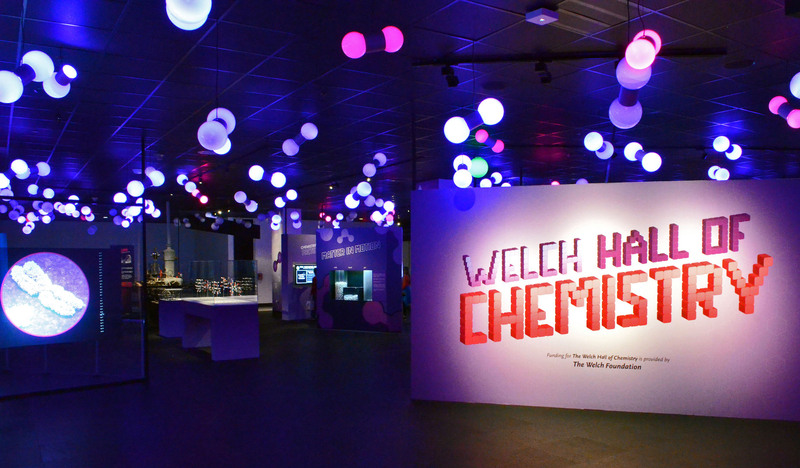 Highlighting the Hall of Chemistry is the wall-sized periodic table containing real samples of each element. Time your stop in the lower level and find the nearby Conoco Phillips “Hands-On” Demonstration Lab where scientists are performing experiments. 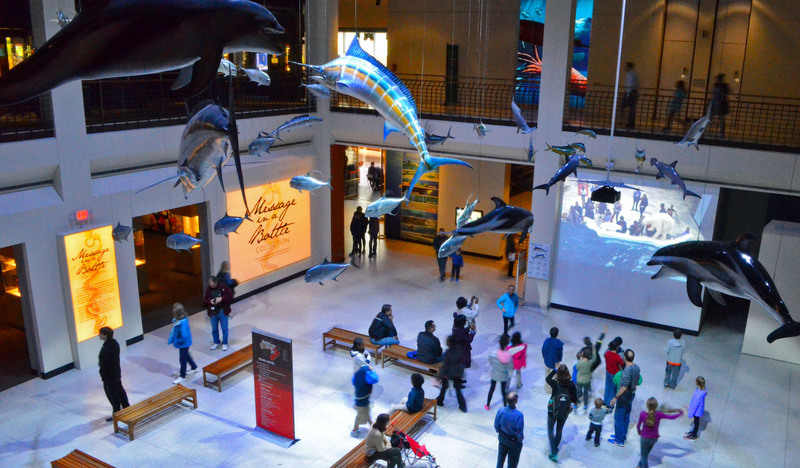 The Houston Museum of Natural Science is renown for its (often simultaneous) special exhibitions that fill out the remaining spaces in the museum. In years past, they’ve brought through their doors a comprehensive Fabergé egg exhibit, a jaw-dropping Terracotta Warrior tour, and the shocking but fascinating international Body Worlds exhibit. Click here for more information on special exhibits available during your visit. The Houston Museum of Natural Science also offers robust group-tailored programming, including annual summer camps, school tours, scout programs, and classroom education (for children and adults) via the dozens of classrooms located on the lower level. For more information on these programs and reservations, contact HMNS Education. In addition, the Houston Museum of Natural Science is known for hosting popular night-out events like its annual Spirits & Skeletons Halloween party and seasonal Mixers & Elixers social cocktail bash. South of Houston, two satellite locations help round out the Houston Museum of Natural Science adventure. HMNS at Sugar Land is a two-story location that offers a scaled-down paleontology hall, a life science exhibit with a colorful variety of living frogs, a space science hall replete with spectacular Hubble images, and an Earth science exhibit filled with ancient fossils and beautiful slices of minerals. Tickets are $12 for adults and $9 for children. Located within Brazos Bend State Park, the George Observatory features three telescopes (14″, 18″ and 36″) that allow the public to peer into the cosmos and find Saturn’s rings, Jupiter’s swirling clouds, or the intricate impact craters on the Moon, dependent on the time of year. Public viewing is available on Saturdays from 3pm to 10pm but keep an eye on weather as it is subject to cancellation on some nights. Entrance to the State Park is $7 for adults, and telescope viewing is $7 for adults and $6 for children. Metered parking is available street-side in the area around the museum, though is prone to filling up by the afternoon. The adjoining parking garage at HMNS costs $20 for non-members and $5 for members. Various membership levels offer free admission to permanent exhibits, and discounts on special exhibits, gift shop purchases, and parking. Individual memberships start at $45 while the Family level begins at $115. There are a handful of lunch spots around town but you can also find a McDonald’s located in the Cullen Grand Entry Hall. Feel free to take advantage of the nearby Hermann Park and McGovern Centennial Gardens if you’ve brought your own food or check out other must do things in the Museum District. Parking: Metered parking is available street-side in the area around the museum, though is prone to filling up by the afternoon. The adjoining parking garage at HMNS costs $20 for non-members; $5 for members. Admission: Tickets are $25 for adults; $15 for children ages 3 to 11; Free for children 2 and under. Click here for a complete list of museum information before visiting.